with soil. 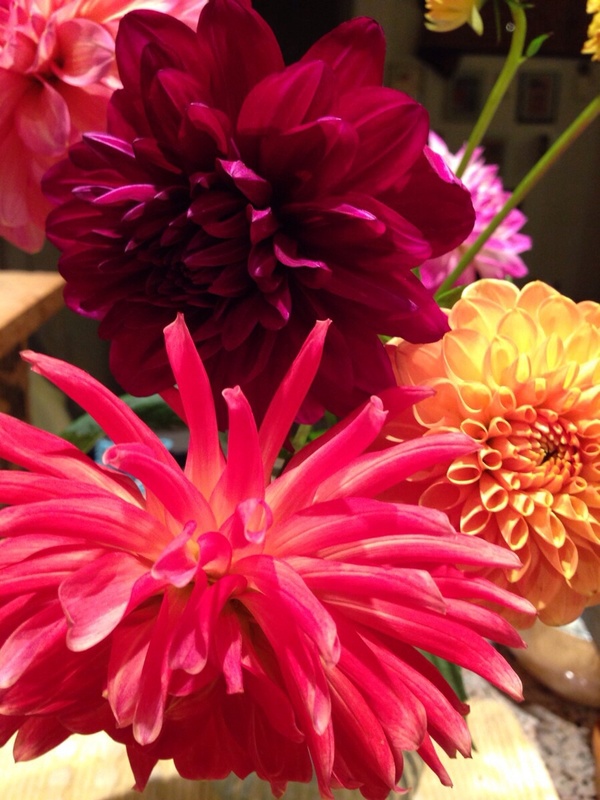 That summer, the small dahlias kept coming. Today was lightly then more heavily drizzling, and cold. Planting time is mid to late May, though some afficianados are putting the tubers in the ground next weekend. I might too, if I can ready the ground in time. One thing I must remember is not to water after I plant. I have seven varieties, selected for color and their name. Bashful. Sweet Dreams. Hamari Accord. And I have a large tuber I overwintered in the studio in packing paper. It grew very well last year, a yellow and pink combination, I think. I was more organized my first year in this garden. Last summer, kittens took precedence over plants. One kitten, now nine months old, plays with its reflection while her mother sleeps somewhere in the house. I am trying to teach the kitten not to run outside. I don’t blame her. Spring and the garden beckons. I will report on the dahlias in the coming months. Teaching is nearly over for the semester, and I can get back to the new novel. I will report on that as well.